Will There Be a 72 Hour Window Before a Collapse? - Begin Prepping Now!! Can you imagine having 72 hours to prepare for martial law? Could this be true? 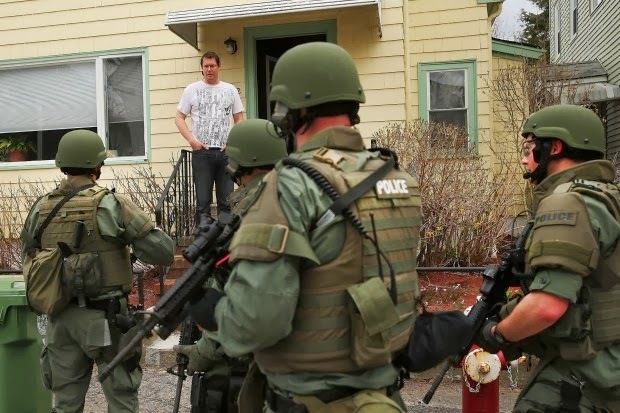 The timing of the Boston Bombing with the national partisan gun control debate is a collision of two events that were hard to overlook when you take into account the very real Katrina-style imposition of Martial Law which descended so quickly on the city of Boston last week. Would the federal government use an opportunity like that of the Boston Bombing in order to grab residents’ guns under the guise of national security? During the aftermath of Hurricane Katrina, local and federal law enforcement were openly confiscating lawfully-owned firearms from residents, in some cases by force at gun-point, and many were speculating this past week whether or not this would indeed happen in Boston as police put the city on lock-down while searching residents’ houses door-to-door in what has been said is America’s largest-ever manhunt for suspected student, Dzhokhar Tsarnaev. This is the a HUGE red flag!!! You have 72 hours before martial law is implemented. The government closes all the bankcards down. People hunker down, cause no one has cash, right?! Then Monday am, the soldiers are on the streets , the government is controlling the banks and the traffic and confiscating guns and valuables under martial law rules, for our own good of course. I have no idea if any of this is true. No one knows for sure. I am only sharing this information, so that if this situation ever crops up… you can keep it in mind. If you see this situation you will be able to make a decision based on your understanding of the facts. I am keeping my ear to the ground, just in case…. It is so scary to hear about there possibilities. However it is more scary whenI hear Americans that condone this kind of behavior from our government. I heard a radio host say that he did not care if there were camdas in the bathrooms of planes and they strip searched everyone so long as he could fly safely. Also for some inexplicable reason my gas company has to get in to my basment once every 3 years to check for gas leaks. As if they don’t put an oder in the gas to make them glaringly ovious. The service man showed up and damanded entrance into my home or he would shut my gas off that instant. I told him my boyfriend was sleeping and it was not a good time. He was overjoyed to inform me that he had the authority to turn my gas off if I did not comply. I asked him why he needed to get into my house if the gas could be smelled if it leaked. He agressivly walked past me toward my house with his tool box as he said this is not Mexico we have the right to be safe in America. I told him to wait and I would ask my boifriend. He followed me to the door and waited at the threashhold. My boifriend said “I’m sleeping just let the @#$ hole in.” I was not happy about it but was not going to fight both of them. He pushed past me and ran down to the basment. I could not keep up. By the time I was down there the whole thing was over. What did he do down there in 10 seconds? I don’t understand any of it. All I know is that I felt violated. The gas company pushed in to my home by threatining to cut my utilities off in the name of a safer America. Did this guy take American history in 3rd grade? He did the very thing the colonists faught and died to stop from happening. Please don’t misunder stand me. My things were not riffeled threw at gunpoint. I do not mean to imply it was that traumatic but I was treatened to have a basic need taken from me if I did not let this stranger in my home. I think that America has “frog in the pot syndrome”. We have been lulled into complacency by a great many things. And things are starting to heat up…We need to be aware of what is going on around us. We need to minimize outside force impact on our personal lives. Have you considered solar power? The more off the grid you are, the less of an impact others can have on your life. It is a good wake up call for all of us. I don’t think people should fear a zombie apocalypse, people should fear that nature will throw a hissy fit or the government will have a power trip. We need to take care of own. It is scary just to imagine what could be possible to not be prepared in an uneventful expectation. Off topic but a great example is mother nature disasters. There should always be a safety plan so that you have a outline of what to do and how to follow through with it. I think monthly drills are a good idea because well you just never know. It’s not off topic at all…the weather has been so unpredictable the world over. Each family should prepare for the problems that are most likely to occur in their area. Preparedness is key to safety!